2009 was a singular year in my life. I was diagnosed with breast cancer and had to stay home during the treatment. As I couldn’t be in a real classroom, I moderated an online course for teachers. During my treatment, one of the participants of the course lost her mom to the same disease. Some weeks later, this teacher e-mailed me asking if she could send me a box with gifts she had bought for her mom but had no chance to give her before her passing. She told me she would send a book about cancer which would help me a lot. I was deeply touched by her offer and answered that I was honored to receive such a special gift. One day, as I got home feeling a bit dizzy after a chemo session, I saw a big box on my sofa. “Wow, what a big box!”, I said. 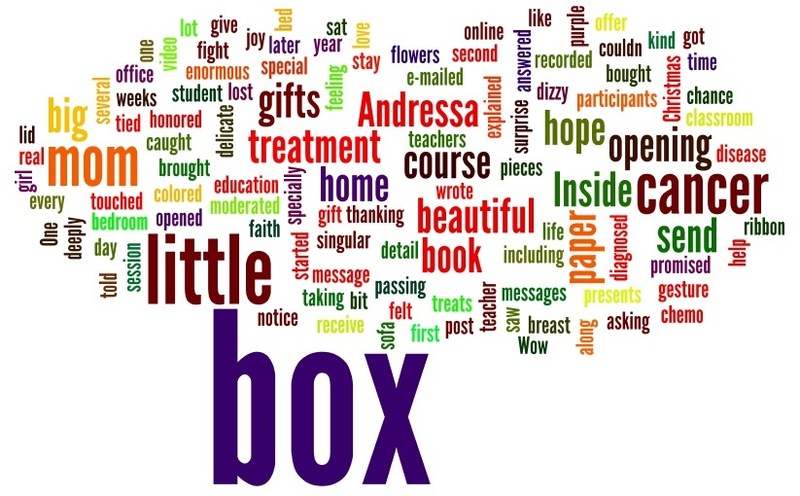 “It’s Andressa’s box!”, I explained while taking the box to my bedroom. I sat down on my bed and started opening the box. Inside the post office box, there was a beautiful second box tied with a purple ribbon. I was caught by surprise when I opened its lid and felt like a little girl opening Christmas presents. Inside the box, there was the promised book along with delicate paper flowers, pieces of colored paper and several little gifts. In every little detail, I could notice Andressa’s love for her mom and her kind gesture in including little treats specially for me, such as messages about education, hope and faith. I recorded a video message thanking my student and for the first time, wrote about my fight against cancer and the beautiful box which had brought me enormous joy and hope. Ana Maria is an EFL teacher and teacher developer in Brazil. She is head of the EdTech department of Cultura Inglesa Uberlandia (a language institute in Brazil), and a designer and moderator of online course Cultura EDtech. Ana Maris is also an enthusiastic blogger and researcher. One of the most beautiful stories I’ve heard and lived.